Spread tomato puree on half balm cake. Add onions or various topping to make the face on your pizza, Eyes nose and mouth. Then put under the grill for a few minutes until they turn a golden brown. Allow to cool for a minute or two before serving. 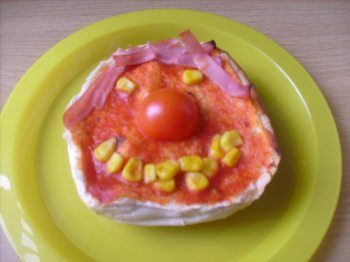 These are super easy and kids just love them, you could even let your toddler help with making the faces before you put them under the grill (That's the pizza under the grill not your toddler). They are a complete meal in themselves. You could add small bowl of salad to the table as well and see if they will have some.